We accomplished a lot over the past couple of weeks and I’m finally starting to feel like I don’t have to freak out on a daily basis. The gardens are loaded up and growing – I’m on to doing battle with the rabbits and making sure the chickens can’t help themselves to the plants. I am grateful for friends and family members who helped me watch the kids, burn up brush and pull out roots in preparation for some raspberries! We managed to plant some cherry trees, and the currant bushes I planted last fall are starting to fill with fruit. I was excited to find a large patch of comfrey growing by the burn pile. Comfrey is an awesome plant to have around a homestead – it has powerful medicinal properties, and is also great for activating your compost. It’s a nitrogen fixer, and I will definitely use it as a chop & drop mulch in the orchard. I’ll talk more about it when I get around to transplanting it. The chickens are getting big and brave. They’re getting acclimated to their new home and starting to venture out in search of the best weeds and bugs. Rather than cramming themselves into a chicken blob under the nest box shelves, they are beginning to feel safe getting comfortable and falling asleep on their own. Hilariously, Harvey (the dominant rooster) is now trying to crow. I let them out first thing in the morning – he rushes from the coop, bursts forth from the barn ahead of everyone else, musters all his breath, and goes “aaaaa!” Rather uninspiring but incredibly funny. Teenage chickens. The kittens have reached a size that allows them to escape their box, and wander willy-nilly through the basement. It is therefore time to put them in the barn. I’ve been putting them outside with their food every morning with the chickens, and feeding them dinner/putting them to bed at the same time as well…so they’re plenty used to the outdoors. But last night their bed was in the barn instead of the basement, which they did not appreciate. Bing escaped at some point and waited on the porch for us to wake up, and Toothless is just tuckered right out, but they’ll get used to it. Think yer traumatized now kittens, just wait till you meet the vet! A good portion of the work around here is not interesting. It’s weeding, mowing, trimming, thinning, weed whacking, cleaning up after animals and kids. It’s masses of excessively dirty laundry, pest control, pruning, tune-ups and sweaty work. We spent the day yesterday just cleaning up around the land. The burn piles had become so large, they couldn’t just be lit, they needed breaking down. Our barn demolition adventures had left our driveway littered with scrap wood and metal, and the newly lovely weather has spurred the growth of weeds. This coming week, I hope to finish up my rainy day cutting board project, plant my last cherry tree and side dress the fall planted garlic crop. I’m super excited for this garlic because I planted several new varieties last year, which will obviously need taste testing. The sun is out, the herbs are up, it’s time to make a julep and enjoy the process! I know it’s a pain to bust out your blender, but don’t skip on the crushed ice. It’s really what makes this drink. In a julep cup or rocks glass, bruise your mint. Add your sweetener and bourbon and give it a stir to distribute the sugar. Fill the glass to the top with crushed ice. Enjoy your whiskey slushy! The birds are getting big. There is one Rhode Island Red who still needs a name that is particularly interested in me. Each morning she reminds me that they are big enough to get out if they try really hard. I change the water, fill up the feeder, climb in the box and give them a treat, then sit next to the brooder with my cup of coffee to observe them for a while. She hops atop the feeder and takes a literal flying leap to perch on the edge of the box beside me. So far she’s happy just to survey the lay of the land in this manner, but I’m taking the hint. They now go through a full trough of food and almost a gallon of water each day with no difficulty whatsoever. The dominant rooster is noticeably larger than the rest, and with the exception of one runtish Cuckoo, they’re approaching the size of softballs. In short, they need to get out of the house. My friend Rebecca helped me put up a simple run right behind the house – very centrally located so they’re easy to keep an eye on. 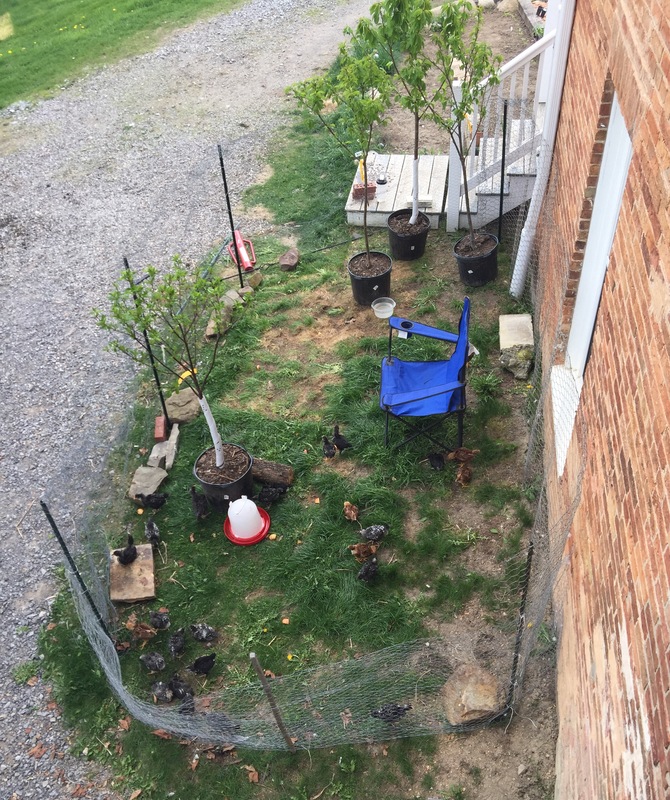 I then proceeded to corner 27 chickens, one at a time, and transport them by Rubbermaid tote to their outdoor space. This is hilarious! “Hurding cats” is the description. They were utterly mystified at first. Grass. You both step on it and eat it. If you’re a chicken you can step on it, poop on it and then still eat it. Awesome! 15 minutes later, they’re fighting over the only dead leaf on the ground, and rolling in the dust, happy as pigs in you-know-what. I will let them out for a few hours a day for the next week or so, then they can move into their coop. The bees. So I know I set up for this big dramatic story of removing the hive from my barn wall, and swarming bees, in only a tiny room, and prying back the walls etc., etc… so believe me, no one is more disappointed than I am in the completely anti-climactic absconding of the bees from their hive the day before we went to remove them. It was equal parts amazement and depression, when we pulled back the walls of the hive to discover that they were all gone! They left behind a section of comb a foot high, 6 feet wide, and 6 inches deep, but no bees. Le sigh. I took the comb out and drained the honey, then rendered the beeswax. Ugh. So. I went to the bathroom, and in the 2 minutes I was gone the beeswax boiled over. Let me tell you, this was a kitchen fail of epic proportions…epic…rivaled only by the time the lid flew off my blender full of hot Sicilian fish soup. I can be amused now that it’s clean, and I have honey and beeswax to show for it. Well, I have everything I need except the bees, I’m not giving up now! Vern, my new beekeeper friend, quickly called the place he orders from and snagged me a couple of spare nucs. So once again (like the chicken coop), this was supposed to be my own free bees, but it now cost money. Deep breaths. In this department, for all of my best laid plans, things are happening to me rather than by me. Just go with it Stacie. In the gardening department, the so-called tomato patch (which is going to fall short of my dreams this year and actually be the everything patch) has been turned over. I ordered a compost mix and managed to spread all 5 yards of dirt by myself in a few hours. My arms were unhappy the next day. A big shout-out to Ariane for her help getting the hot pepper patch expansion onto the herb garden. Looking forward to some hot sauce & pickles! And lastly, in the department of random and unplanned stuff, a couple of very tiny kittens fell out of the barn roof. They can live with the chickens. A big “THANK YOU” to the great people who helped me out this week! Next week: the bees move in to their hives, plants that have survived the wind storms get planted, and kittens learn to eat solid food. This cold spring is no fun. The fact that the sun hasn’t been out long enough to dry anything up means I can’t dig my new garden without getting the tractor stuck. There is more cold in the forecast later this week, so I dare not try to pry the wall back on my barn bees. In fact the bee shipment has been delayed due to the cold anyway. I’ve been building a chicken house in one hour increments because that’s how long my fingers can go without gloves on the nicer days. So this week I’m going to try my best not to get depressed, but to focus on parts of my plans that can be accomplished on the edge of spring. So this blog may not be terribly interesting, sorry, it’s more for my own benefit to help keep me motivated. Side Note on Barn Demolition – over the one nice Saturday we had a barn razing. To the north of the house there is a small barn that actually pre-dates the house. The cool thing is the history of it, the down side is that it’s right in the view. Since the roof of this barn is beyond repair, and over the years other owners have covered it’s sides with sheet metal, and the groundhogs have completely undermined its foundation, we’ve decided to take it down and salvage the nicer wood. The beams are beautiful, and the main sliding door is perfect for a loft apartment somewhere. Most of the siding that hasn’t been destroyed is very thin, too thin to plain. We’ll save what we can for some wood shop projects. More on that later. So here we go! It’s Monday and it’s freezing, but the sun is out so Im working on the chicken coop. I finished putting the metal on my chicken house roof. Since making money on eggs isn’t really a thing, I’m not investing much in this structure. I’ve spent a little on hardware, but mainly it’s constructed from a hodgepodge of materials the previous homeowner left behind in the barn. Fava Experiment – at some point over the winter I read someone else’s method of starting fava beans indoors if you weren’t able to sow them direct the season before. I decided that I would give it a try but not take it too seriously. I used some older seeds and sure, they popped up healthy, but even a fava bean won’t like this weather and I left them in the tray longer than I knew to be good for them. They are tall, spindly and root bound, but I’ve hardened them off over the last few days and now the brief reprieve of sunshine gives me the opportunity to put them in the warm-ish ground, stake them up and drape them with a row cover. I’m not expecting much, but I’ll report back on that later. My cabbages are ready to plant now, but I don’t have a place for them! I had plans to expand my kitchen garden anyway, so I’m going to go ahead and get started on that and use it to save my seedlings instead of waiting to plant herbs in it. The cabbage will be finished early enough to successively put herbs in. I can also use the tomato patch location for this. I’d rather use an alternate tomato location than lose the cabbage. So I’m going to go ahead and start hardening these plants off today. The snow is finally gone, so we can FINALLY start digging out the new garden this week. Tomorrow, it’s supposed to be 38, rainy and super windy. Yuck. I’ll take care of the seedlings, start a few vines indoors and maybe give the dog a haircut.